Presentation “SEO for developers” about the technical side of SEO, with best and worst practices to make your page more appealing both to visitors and searchbots. Delivered as an internal training session in ASPgems in Madrid. Presentation “La herramienta de desarrollo definitiva” about changes in software development introduced by the cluetrain manifesto, the agile manifesto and the importance of the individual over the technology. 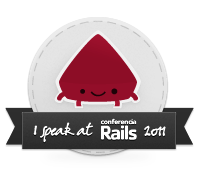 Delivered at Conferencia Rails 2009 in Madrid. Presentation about Making games in Ruby with Gosu I delivered at EuRuKo 2009 in Barcelona. Presentation about Jruby I delivered at the Sun Open Communities Forum 2009 in Madrid. Ponencia expuesta en la Conferencia Rails 2008 en Madrid. Video of the Web Development Frameworks Panel held at SIMO 2007, in Madrid. I was talking about Ruby on Rails. Other panelist were talking about Java Server Faces, Dot Net technologies, PHP Igniter and Drupal. Programa en Rails como si jugases con Lego (Desarrollo de Plugins con Rails) Ponencia expuesta en la Conferencia Rails 2007 en Madrid. ‘XML y Rails como herramienta de Integración’, ponencia expuesta en la Conferencia Rails 2006 en Madrid.